Capital preservation is protecting yourself from losing money when you make a mistake. And you WILL make mistakes. Basically, it ensures that no event, no matter how big or small, can put you out of business (so to speak). But it is NOT safe investing. Digging yourself out of a hole is VERY hard (see my page on compound interest). Capital preservation helps you avoid digging one in the first place. That is why it is the first step on your way to better investing. Capital is money that you use to purchase assets or new "stuff". From a personal finance perspective, think of it as your profit; the hard earned money you have after paying all the bills. Capital is your ability to buy new things. Preservation is the act of protecting something from loss. So a capital preservation is the act of protecting your ability to buy new things. Throughout the site, I describe using portfolio sizing and position sizing; these are ways to minimize the amount of money you risk with each trade. The topic is popular during periods of uncertainty (either in the financial markets or global economies). But minimizing risk is something you do for every investment and/or trade, regardless of what the talking heads are saying. You may have noticed that capital preservation is the first of three steps to better investing. The reason this is the first step is simple. You need to have the ability to buy assets if you're going to invest. If you don't have any money, you can't buy any stocks, bonds, mutual funds, ETFs, etc. If you live from paycheck to paycheck, you have no money to invest. If you have no money to invest, you can't generate income or grow your accounts by investing. Investing one of the only ways to have a chance at "retirement" in the traditional sense. If you don't save and invest for retirement, you'll quickly lose the ability to buy things once you stop working. As soon as retirement planning moved away from defined benefit pension plans (employer sponsored) to defined contribution plans (employee sponsored), the burden of preparing for retirement shifted from employers to employees. 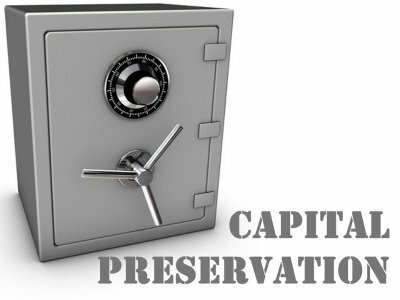 Where to use Capital Preservation? You need to use it in all your accounts. Keep in mind that some investment brokers and banks will impose maintenance fees if you do not maintain a minimum balance. This helps them offset the low commissions they charge. I once had an account that charged $25 if my balance fell below a certain threshold! That's $300 per year! Needless to say, I preserved my capital by moving it elsewhere. How to use Capital Preservation? As mentioned in the better investing page, avoiding losses at all costs is at the core of safe investing. Losses can come in the form of day to day expenses, commissions, fees, taxes, interest payments, inflation, deflation, bid/ask spreads, getting fired, accidents; the list goes on and on.